We love geeky cakes here at Geeky Gadgets, and have featured quite a few different ones over the last couple of years like the cool Han Solo in carbonite cake and the awesome Wall-E cake. 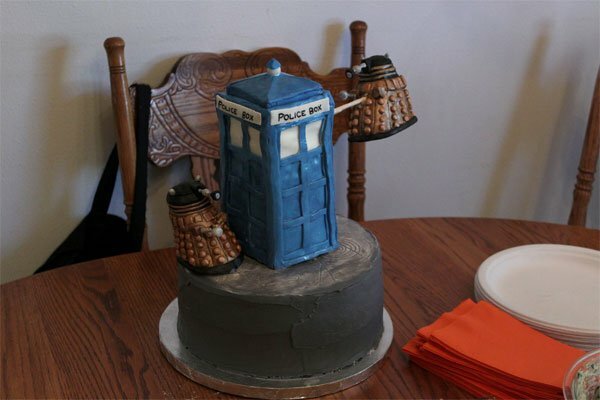 Now we have one for all the Doctor Who fans out there, the Doctor Who Tardis Birthday Cake, this fun cake was created by Flickr user Obajoo, and it even features a Dalek attempting to get inside the Tardis. Here’s the cake I made for my birthday. It’s not as good as I had planned, I just ran out of time. I was trying to make it look like the Daleks were shooting exterminate rays at the Tardis. One fell down when I moved it, but it was a good learning experience. It was almond cake with white modeling chocolate and some gum paste. Very cool, definitely one of the coolest birthday cakes we have seen in a while.